Did you know that Pilgrims Choice has recently launched a new interactive campaign encouraging the general pubic (you & me) to ask their super duper cheese experts about absolutely anything. What would you ask a cheese expert? How long cheese take to mature? How do you know when a cheese is ready for eating? How should you store cheese? Which Pilgrims Choice cheese should I buy and what recipe would it work especially well in? Why not give them a “like” on You Tube if you think the videos are fun. And they are. Really. 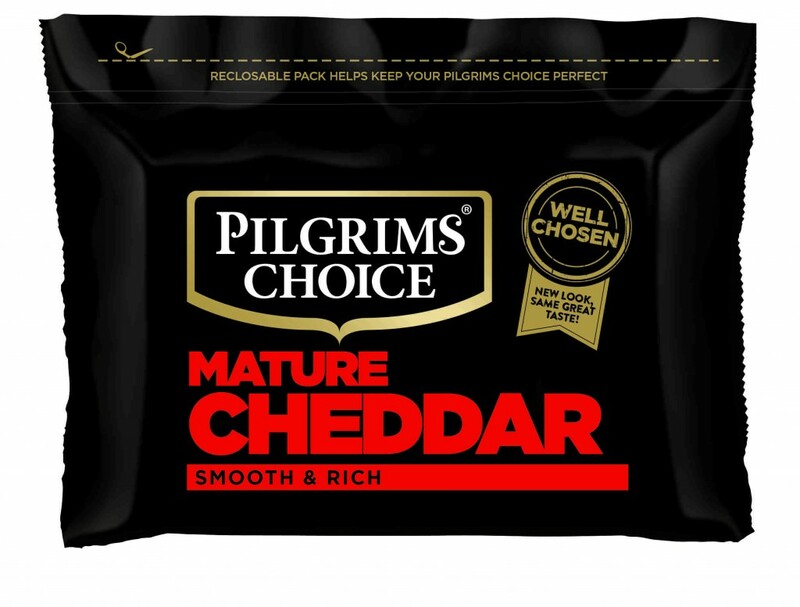 If you would like to enjoy more videos or join in with your cheese based queries then you can follow the #AskACheeseExpert hashtag on twitter and follow @PilgrimsChoice for updates. Even better, I have a recipe for you from the guys at Pilgrims Choice. So, if you decide to pop some cheese into your shopping basket this week, then I would recommend you try out this Spaghetti Nero. 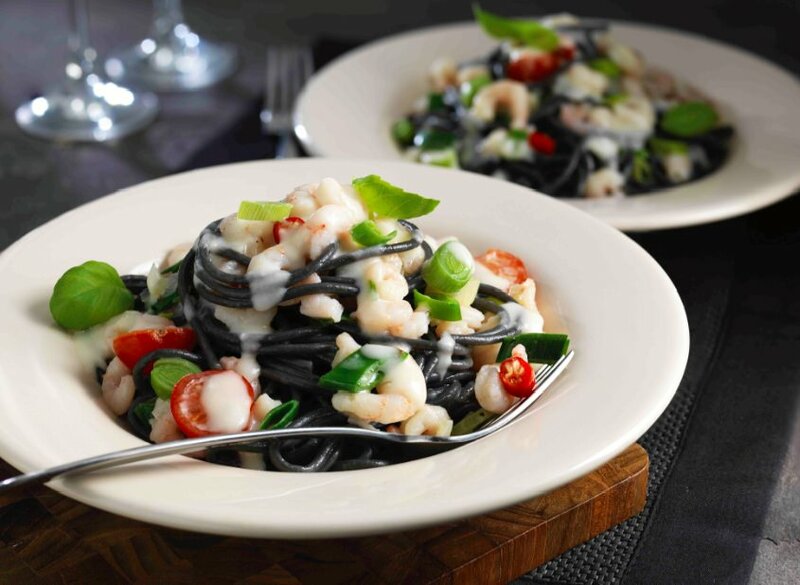 The black spaghetti looks beautiful, dark and dramatic. The sauce is filled with flavours of the Mediterranean. Garlic, white wine, chilli and vine tomatoes. 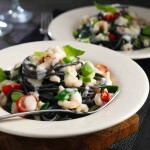 For added luxury and a taste of the sea, scatter in the recommended shrimps. 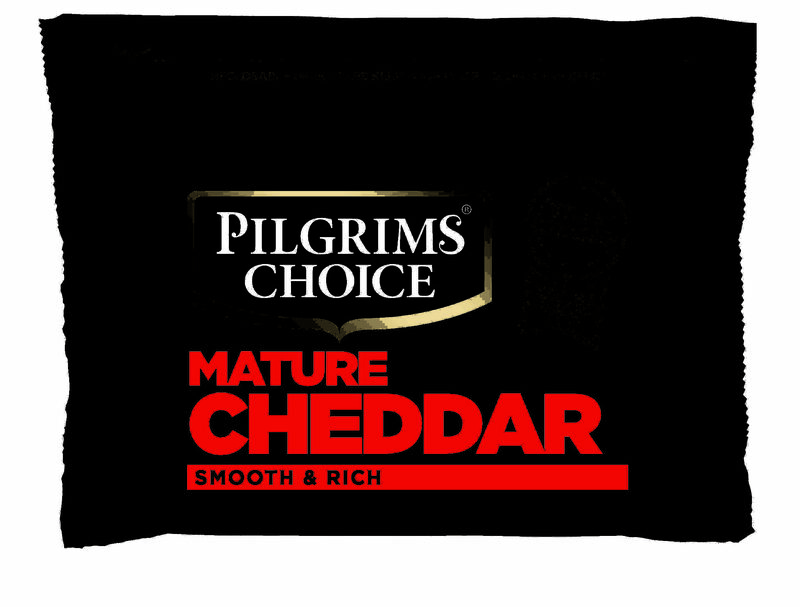 Don’t forget the Pilgrims Choice mature cheddar for added punch. Apparently the recipe was inspired by the brand new black packaging. Bold, striking and a step away from other cheese makers in terms of individuality. What do you think? Drain and serve with the sauce. Images and recipe courtesy of Pilgrims Choice.